Comfort is not an easy feeling to induce. It’s something we all treasure, something we nourish ourselves with, something we love about our homes. But how many restaurants evoke it for you – putting you at ease in the same way? Not that we want to eat out in our pyjamas, of course. My point is that it’s hard work to appear easy-going, to trigger genuine feelings of relaxation, contentedness and conviviality in your customers. It’s hard work, but Harte’s Bar & Grill pulls it off. Aptly named, this gorgeous gastro-pub sits at the heart of Kildare Town, bordering Market Square under the shadow of St. Brigid’s Cathedral. It lay neglected for much of the noughties, I learn, before reopening under the ownership of brothers-in-law Paul Lenehan and Ronan Kinsella in late 2009. Barry Liscombe is head chef, and word of his cooking has spread. Harte’s is a new entry on John & Sally McKenna’s 100 Best Restaurants in Ireland. 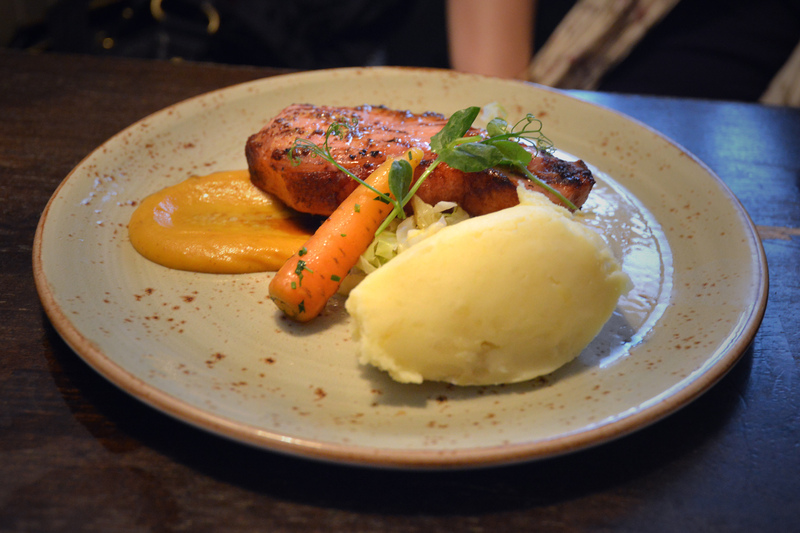 I’d rank it alongside Fallon’s of Kilcullen and The Ballymore Inn – a trio of richly accomplished gastro-pubs in Kildare – although it wasn’t until a recent trip to see the spring foals at the nearby Irish National Stud that we finally got to give it a try. The menu ticks all the boxes, offering a choice of five starters and eight mains – with two seasonal specials (fish pie with Dubliner cheddar mash and fennel salad, and a mustard and honey glazed bacon with cabbage and sweet potato puree) on the board. Several craft beers are matched with the mains, and Harte’s support for artisan and small farm suppliers is noted, rather than trumpeted. 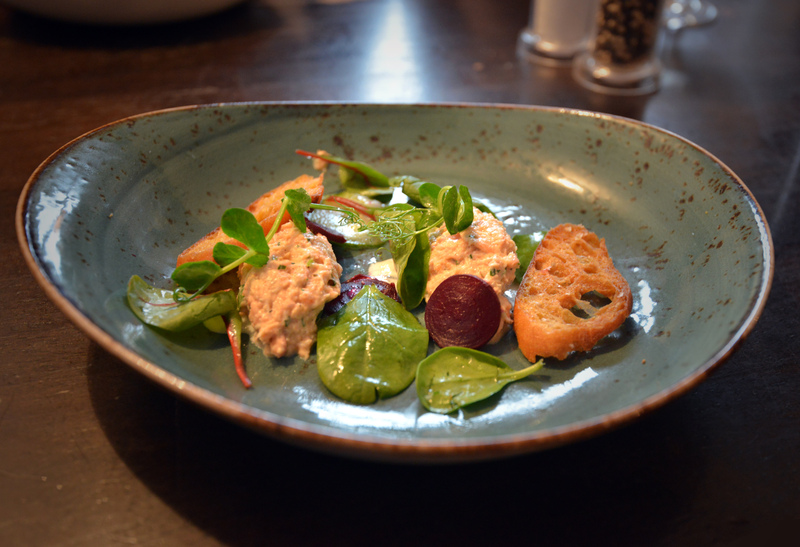 The starters are the prettiest dishes of the day – my Goatsbridge smoked trout and fresh crab parfait (€9, above) is light and delicious, delivered in two dollops alongside leaves, pickled beetroot and crispy toast in a lovely pottery bowl. A decadent Ballysax chicken liver pâté (€8) is hidden under a thick coin of sealing fat and served with toasted sourdough and fig relish. The combination of sweet relish and smooth pâté is tingling. Our mains aren’t as pretty to look at, but they bring just the right mix of cheffy flourish and creature comfort. The bacon and cabbage is anchored by a thick hunk of deliciously glazed meat, with a scoop of mash, roasted carrot and a swipe of sweet potato purée shot through with notes of cumin on the side. Like all of our dishes, it neither overreaches nor underwhelms (below). Other mains include a Hereford beef burger (served on a Waterford blaa at €15), a chickpea and red lentil curry (€14), and a seven-ounce fillet steak served on a stone (€24) – a bit of fun that has its health benefits, but which I can’t help finding gimmicky. Harte’s fish n’ chips (€17) sees a soft and juicy piece of hake caked in crisp batter alongside ramekins of mushy peas and tartar sauce, and my Ballysax chicken breast (pictured below) comes with mash, roast carrots, mushrooms and a smoked Knockanore cheddar purée. The breast is moist, the mushrooms an interesting addition, and though I reckon slightly more could be made of the mash (perhaps we’ve had enough calories for one Sunday, mind you), its craft and ingredients thoroughly justify the €17 price. The room is a good fit, too. Sleek banquettes, original tiles, patches of exposed brick and tasteful wooden floors and panelling are worked around a space sufficiently broken up to allow families and couples their own elbow-room. Potted plants and Venetian blinds give the old pub some poise, and friendly staff are outfitted in light-blue shirts and tan aprons. Like the food, they’re a well-judged bridge between casual and classy. Given the amount of families coming and going at Harte’s, it’s encouraging to see thought has also gone into the kids’ menu. Better still, kids can eat certain items – including a pasta dish, chicken goujons or cocktail sausages – for free before 6.30pm. Remarkably, all desserts (€6) – which include a Swiss roll, apple and hazelnut crumble and white chocolate and orange ganache – are available gluten-free. That’s unusual, and L – who is coeliac – very much enjoys her chocolate sundae with Rossmore ice-cream. Quibbles? The service is a little slow at times, I have to order a drink twice, and the kitchen forgets to include a confit leg croquette with my chicken (its follows on a side plate). 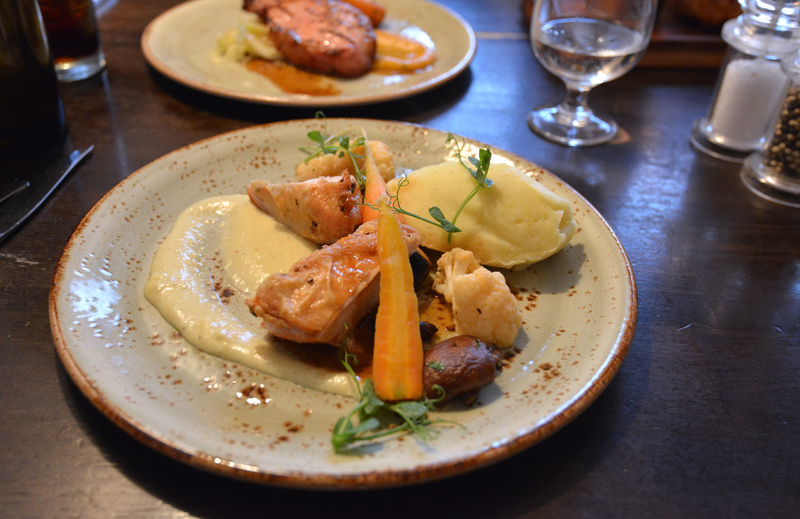 Overall, however, Harte’s is a very polished gastro-pub. It strikes a smart balance between ambition and amenity, providing Kildare with a hub many towns might wish they had. Dinner for two adults and two kids came to €68.30; tip extra. This Hartes Kildare Review also appeared in The Irish Examiner.